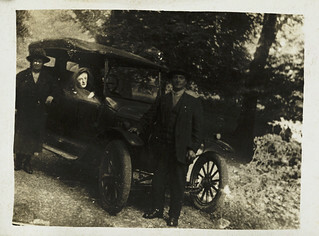 Two of William Hope's friends lean on their motor car whilst a figure - the couple's deceased son - is revealed at the wheel. Hope had suggested a photo opportunity for the 'chance' of obtaining a spirit impression. Commercial use: To license selected images for commercial use, please visit the Science and Society Picture Library, which represents the visual collections of the Science Museum Group (National Media Museum, Science Museum, National Railway Museum, Museum of Science and Industry). Buy a print: Thousands of images from the SMG collections are available to buy as decorative prints, postcards, greeting cards, and mugs from SSPL Prints.